...or TV show or play. I watched the season premier of the US version of Prime Suspect. Now before you say anything, no it is NOT the same as the original UK version with the fabulous (and still hot) Helen Mirren. Not supposed to be. Apples and oranges. Same title, sorta the same premise and the lead character has the same first name. Whatever. It's a good show. I like it. Maria Bello is strong in a part not typical for American TV. BUT (notice the capital letters for emphasis? ), what I truly love about the show is the supporting cast. Great character actors you've seen a million times yet probably don't know their names. Brian O'Byrne, Kirk Acevedo, Peter Gerety -- all actors you have seen hundreds of times. These are the people Liz and I always say, "Oh, I love that guy! He was in that other thing. What's his name?" The idea that a great supporting cast can save an otherwise forgettable movie is not a new one. 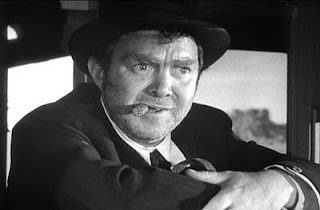 My in-laws used to say that when they were young they would go see any movie that had Thomas Mitchell or Barry Fitzgerald in it. For me it's Ward Bond. And Thomas Mitchell. And Ruth Hussey. Oh, and Edward Arnold, H.B. Warner, Mary Astor and a dozen other character actors that will always turn in an amazing performance no matter what. If fact, I'll go so far as to say that John Wayne was so incredibly famous because, in every movie he ever made, he was surrounded by great supporting players. They made him appear better than he really was. Classic movies (you know, like you see on TCM) are great examples of putting together great actors around certain movie stars to make a movie work. Oh sure, Cary Grant and Rosalind Russell are perfect in His Girl Friday, but imagine what that movie would have been like WITHOUT Gene Lockhart, Abner Biberman or Clarence Kolb. The same holds true today. If a movie has a star I don't necessarily care for or don't know all that much about, I will take a risk on it based on the people around him. I am not a big Leonardo Dicaprio fan. I, generally, just never believe his performance. However, I went to see Inception when it was out. The supporting cast made that movie for me and, as a result, I actually enjoyed Leo. Not all character actors were or are movie stars, or even famous for that matter. The cast in Prime Suspect is a perfect example. And quite frankly, not all movie stars should be famous. They should be characters actors, second fiddles that make up a great cast. Ben Affleck (for my money) can't carry a movie on his own -- as the star. But, he is a very capable supporting actor. Dare I say, excellent. Shakespeare in Love and State of Play are examples of Ben's ability to create memorable performances -- just not leading ones. This idea is true on stage and on TV, too. Broadway has made a living lately by injecting "big name" stars into limited runs of things. Of course, the regular cast of Chicago does all the heavy lifting while songwriter and former American Idol judge Kara DioGuardi dances around as Roxie Hart. Somehow it's all forgiven when the the supporting players make her look like she belongs there. So, before you blow off seeing any movie or TV show or play, look up the names NOT on the poster. If it's a classic film and has Ward Bond or Thomas Mitchell in it, for sure watch it. It'll be great! Guaranteed. Frank Morgan. "Who rang that bell!"